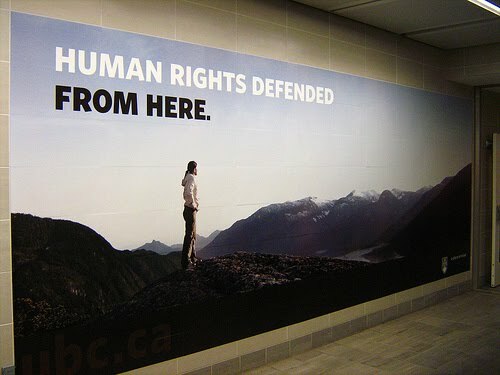 I pass this poster every Monday, in the building where I teach a class on Human Rights. Seeing it always induces a kind of cognitive dissonance, as my class is explicitly not a defence of human rights, but a critique. I happen to think that that’s the business of universities: critique, questioning, critical reflection. 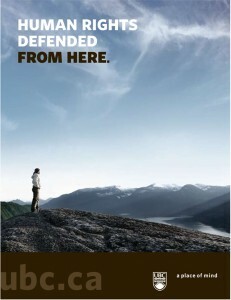 Anyhow, the poster is an advert for UBC, featuring a solitary figure on a mountain top and with the slogan “Human Rights Defended… From here.” I have little idea what it’s supposed to mean, and there’s not a word of explanation either on the poster itself or anywhere on the UBC website. 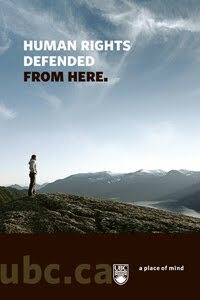 The image certainly doesn’t seem to have much to do either with the university or with human rights. Yes, once again the campus had been turned into a movie set. 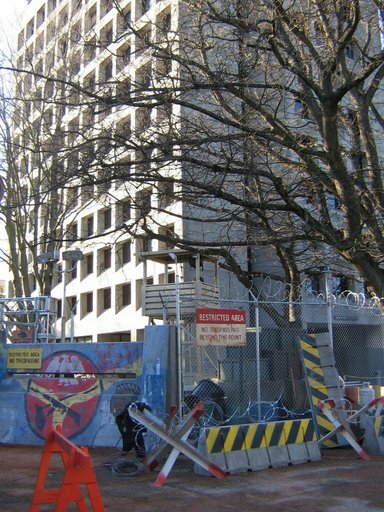 (Rumor has it they were filming Wolverine .) Still, I thought that there was perhaps some poetic truth here about the contemporary university. How is it that the campus swimming pool is open longer hours than the library? On Saturday, one library shut up shop at 4pm; the other main library (sorry, actually it’s now a “Rich person’s name ‘learning center’“) hadn’t even bothered to open its doors. 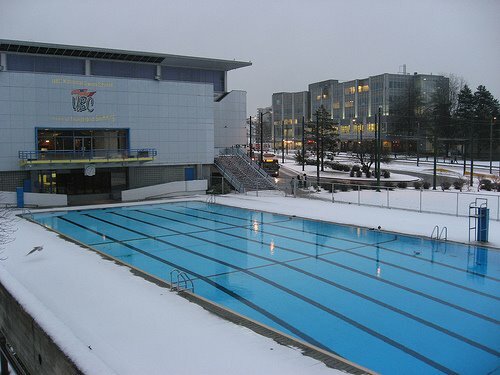 And yet the swimming pool was still open when I was going home at around 8pm; indeed, to add insulting extravagance to injury, they had the outdoor pool heated and uncovered despite the snow around and about. Can’t the university at least pretend it’s an institution of higher learning, rather than a place to babysit 18 to 22-year-olds? Image courtesy of freedyk on flickr. of the owner or occupier as the case may be. Heck, they could even hire people to do it for them.